Located in Central Missouri, Lake Ozark is a charming rural town on the eastern side of Lake of the Ozarks, for which it takes its name. Encompassing 7.95 square miles of picturesque natural beauty, around 1,700 residents make their home here. With stunning waterfront views and nature all around, Lake Ozark is a popular vacation destination, particularly in the summer months. Although a small town, Lake Ozark boasts a number of restaurants, bars and eateries. Conveniences such as groceries, pharmacies and banks can all be found a short drive away in neighboring towns. Most recreational activity centers around the lake. Mariners will find boat access at Bangell Dam, as well as at a number of other public ramps close by. Public Beach #1 is the local spot for swimmers, sunbathers and picnicers. The Osage National Golf Club features an Arnold Palmer Signature course, dining room, swimming pool and fitness center that is accessible to members 24 hours a day. Whether making a permanent move or looking for a vacation home, there is wide variety of properties from which to choose in Lake Ozark. Cozy two bedroom cabins and condos are quite affordable in Lake Ozark, and mid sized single family homes and spacious condos are also reasonably priced. For waterfront luxury homes, look no further than Lake Ozark, as those are also found here in abundance. 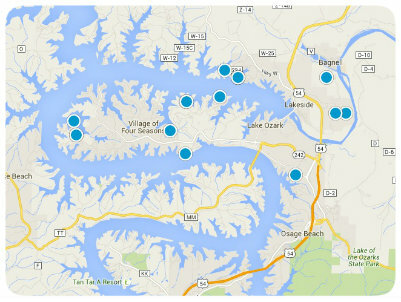 Regardless of the address, every home in Lake Ozark enjoys the natural beauty of the Osage River Valley. If you would like more information regarding homes for sale in Lake Ozark, Missouri, please do not hesitate to contact us today. Huge family home located in Ridgecrest Subdivision.